At the start of each year we talk a lot about goals and planning here at All Freelance Writing. And that's for good reason. It's much easier to get from where you are now to where you ultimately want to be when you have a plan in place, and every good plan starts with a goal. That said, we sometimes get stuck on the concept of "resolutions" this time of year. It can be a turn-off to those who have a history of failing to live up to past resolutions (haven't we all?). But resolutions aren't your only option. Today I'd like to talk about four options we all have when it comes to beginning-of-the-year planning, and I'll share some of my own general plans with you like I do every year. Resolutions are funny things. While they're meant to help us improve our lives in some way, they can often feel more like punishment. They're often extremely ambitious. And they often revolve around a negative -- "stop this," "don't do that," etc. That's not to say all new year's resolutions are negative. And perhaps framing yours in a more positive way is all you'll need to stick with them this year. Stop wasting hours every day on social media. Take a course at the local college to pick up a new skill. Spend at least a few hours every day working at a standing desk. This year most of my resolutions relate to my non-work life more than my business. For example, one resolution is to get back on a regular workout schedule (something I've slacked off about for the last several months). Most of my personal resolutions are health-related. If the thought of setting "resolutions" makes you cringe, consider setting some plain old goals. You can't successfully run a business without having some sort of goal to work towards, whether or not you've formalized your goals in a business plan of some kind. Personally I like to keep a mix of long-term goals and short-term, easily-accessible goals. If you worry long-term goals will feel as unachievable as past resolutions you've set, focus on shorter-term goals and let them ease you towards bigger changes. For example, instead of resolving to stay away from social media most of the day, you might start with a smaller, simpler goal of setting specific social media time. You'll get your fix, but it won't bleed into time scheduled for other work. You might even start with multiple social media blocks in your schedule, and slowly cut them down as you figure out the minimum time you need to spend there to see a benefit (assuming we're talking about using social media for your business). Most of my goals this year focus on revising existing manuscripts and web development or design projects for my various websites. I'm pretty happy with where things stand on the freelance side of things, so I don't have any huge changes planned there. If traditional goal-setting is something you struggle with, why not take another approach and challenge yourself instead? These can be year-long challenges such as challenging yourself to read a certain number of books that can help you improve your writing career. They don't even need to last the full year. For example, you might challenge yourself to write a certain number of words each week until you finish your current manuscript. You could also focus on short-term challenges such as monthly writing challenges. They include options like reaching a monthly word count goal, writing 30 blog posts in 30 days, and writing 30 queries in 30 days. My one guaranteed challenge each year is taking part in NaNoWriMo. This year I'll most likely use that challenge month to work on my next mystery novel, unless I manage to find time for it before then.This year I'd love to challenge myself to complete all of the community challenges at least once. It's not a high priority, but I've been meaning to document progress on all of them as an example, so I'll start that in February and see where it goes from there. My big yearly challenge this year is more about reading than writing. I haven't made enough time to work on my reading list over the last few years and my "to be read" pile has grown into a bit of a beast. I put together my novel reading list this year, but I'm still deciding on new nonfiction and short story collections. As far as fiction goes, I'm aiming mostly for a mix in the genres I'm writing in -- mysteries and horror. And I'm combining new reads with old favorites I haven't read in years. Looking for a reading challenge this year? Bustle.com compiled a list of 12 reading challenges. The list was from 2015, but it's just as relevant now. You're bound to find one that appeals to you. Experiments are a little different than setting specific goals or challenges for your writing career. But they can be just as important, and they can lead to longer-term goals once you have some data to work with. They're also a great option for the non-planners out there who are looking to try something new this year. This will be a big part of my business in 2016. I have a few longer-term experiments planned, and if I get through them I'll share the results here with you once the data is in. But I'm also experimenting heavily on a more regular basis as well. This year those experiments include working with new ad models on one of my key websites, testing new affiliate promotion strategies here, experimenting with new genres in short fiction, and experimenting with new marketing and PR efforts. The results of experiments now will likely influence my bigger goals for next year (such as moving other sites to new monetization models based on this year's testing). 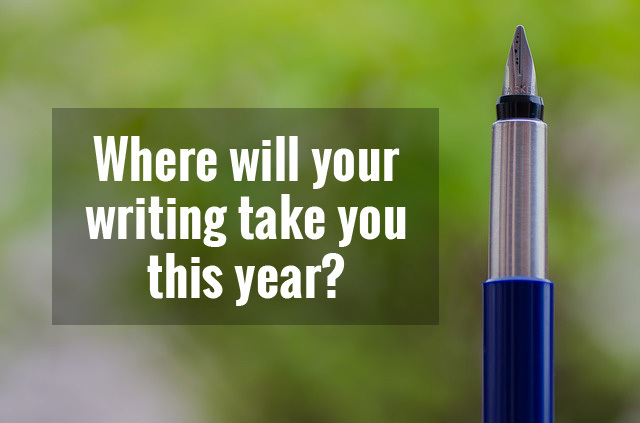 No matter how you choose to move forward with your writing business this year, goals, challenges, and experiments can all help you earn more from your writing and reach more readers. How are you approaching your 2016 plans?